But what will the Ten Little Dinosaurs do when they meet a grumpy triceratops? And a stomping diplodocus? And a HUNGRY T-REX? Part traditional counting rhyme, part fun-filled story, Ten Little Dinosaurs is perfect for sharing together. Read the bouncy rhyming story and count from ten to one and back again, as the dinosaurs disappear then reappear. Spot and count the details on each page, and join in with all the great sound-words! The Ten Little series has sold over a million copies worldwide, and Ten Little Bookworms is a 2019 World Book Day title. A fab rhyming board book. Packed full of colourful illustrations. Count down from 10 Little Dinosaurs until there's only one and who comes to find him - Mum. 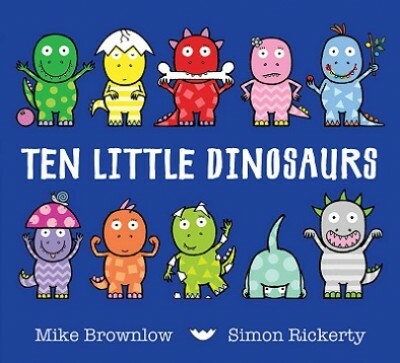 Ten Little Dinosaurs is a fantastic board book, perfect for helping little ones learn to count. Beautiful, bright and colourful!